Written for CBSNews.com by Christine Delargy and reported by Khaled Wassef and CBS News Correspondent Bob Orr. CBS News has obtained a copy of the trailer to the documentary "Homegrown Jihad: The Terrorist Camps Around the U.S." The film was produced by PRB films, in association with The Christian Action Network. The film exposes 35 Islamic terrorist training compounds in various parts of the United States. 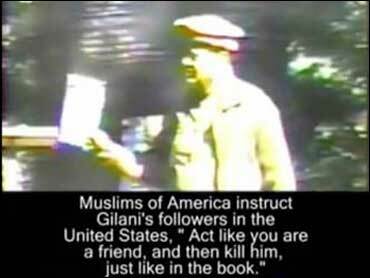 It shows that under the leadership of radical Pakistani cleric Sheikh Mubarak Gilani, this group, Muslims of America, has trained thousands of men for homegrown jihad, while remaining virtually unknown. The film also includes clips from a "secret" training tape in which American Muslims are recruited into what is considered one of the most advanced courses in Islamic military warfare. These "Soldiers of Allah" are trained in explosives, kidnapping, murder, firing weapons and guerilla warfare. Officials describe the film to CBS News as "sensationalistic" and without any real foundation. According to one official, it is strictly designed to upset and inflame people and does not present a true picture of any so-called "homegrown Jihad" danger. No current intelligence exists to suggest any threat connected with this group, which officials describe as "wannabes" and not terrorists. The Department of Homeland Security and the FBI are aware of the movie and have no plans at this time to issue any new alerts or bulletins.